Wow, it's Friday already. Did this week just fly by or what? There wasn't too much in the way of earth-shattering, crazy-exciting news to report on this week, but lots did happen in the CrackBerry world including the "official" launch of the AT&T BlackBerry 8820. Read the Headlines After the Jump. 1. BlackBerry Plug-in for Microsoft Visual Studio Available for Download - We found out it was coming back in May, but this week the plug-in became available for download on the BlackBerry site (click the headline title). The BlackBerry Plug-in "greatly simplifies wireless application development, deployment and management for the enterprise." 2. Idokorro changed their name to Rove - It looks like it's becoming a trend to admit when you make mistakes. Palm did it when they decided to can the Foleo, and now BlackBerry solutions developer Idokorro has followed suit in admitting their wrong by renaming their weird to pronounce company name to Rove. I have to admit, Rove is much easier to say than EYE-DOH-CORE-OH (or was it EYE-DOKE-A-ROW), but when I hear ROVE I think of the Mars' Rovers, not a BlackBerry app company. 3. AT&T Announced BlackBerry Email Address Changes - Those with @mycingular.blackberry.net addresses will be migrated over to @att.blackberry.net addresses in the next couple of months. 4. 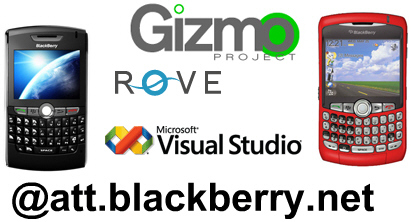 Gizmo Project Comes to BlackBerry - Gizmo Project released a BlackBerry compatible version of their software this week. Gizmo Project is an all-in-one instant messenger (ties in Gizmo Project, Yahoo Messenger, Windows Live, Google Talk users) and allows you to make free calls to other Gizmo users and cheap VoIP calls to cell phones and landlines. Sweet! 5. AT&T Launched the BlackBerry 8820 - Yup, finally. We said it would happen weeks ago, and we were wrong. But it's finally here and you can now pick up your WiFi-equipped, BlackBerry 8820 from AT&T. AND... if you're wondering, the GPS IS fully functional. The whole 'neutered' GPS thing was never an issue. Oh well, it did cause for some excitement in the blogosphere. While we're talking AT&T, another headline this week is the rumored launch date and color availability of the AT&T BlackBerry 8310. 6. CrackBerry.com went down! - Yeah, that's right, we had a small server glitch yesterday that caused us to be inaccessible to the CrackBerry-loving world for about one hour, twenty three minutes and forty-two seconds. CrackBerry.com has been going through some crazy growth (every day we set a new record for the number of visitors coming through the site) and it looks like we're almost due for a server upgrade. It's a headache, but a good headache to have. Keep Spreading the CrackBerry.com word! Check Out Today's Forum Posts to See What the CrackBerry.com Community is Talking About! And For More Stories, Check Out the CrackBerry Blogs, Reviews & Forums!